Capillary electrophoresis and microchip capillary electrophoresis are powerful analytical tools that are particularly suited for separating and analyzing biomolecules. In comparison with traditional analytical techniques, capillary electrophoresis and microchip capillary electrophoresis offer the benefits of speed, small sample and solvent consumption, low cost, and the possibility of miniaturization. 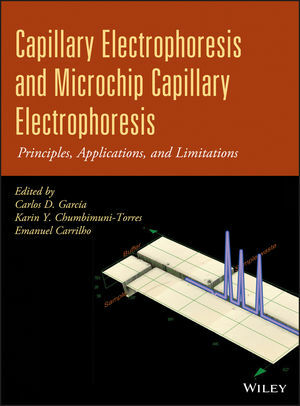 With contributions from a team of leading analytical scientists, Capillary Electrophoresis and Microchip Capillary Electrophoresis explains how researchers can take full advantage of all the latest techniques, emphasizing applications in which capillary electrophoresis has proven superiority over other analytical approaches. The authors not only explore the benefits of each technique, but also the limitations, enabling readers to choose the most appropriate technique to analyze a particular sample. Each chapter begins with an introduction and ends with conclusions as well as references to the primary literature. Novices to the field will find this book an easy-to-follow introduction to core capillary electrophoresis techniques and methods. More experienced investigators can turn to the book for troubleshooting tips and expert advice to guide them through the most advanced applications. Carlos D. García, PhD, is an Associate Professor of Analytical Chemistry at the University of Texas at San Antonio, USA. His group is currently focused on the development of novel bioanalytical strategies involving microfluidics and nanomaterials. Karin Y. Chumbimuni-Torres, PhD, is a Research Associate at the University of Texas at San Antonio, USA. She is interested in pursuing the development of electrochemical biosensors and their integration to microchip-based platforms. Emanuel Carrilho, PhD, is an Associate Professor at the University of Säo Paulo, Brazil. With more than twenty-five years of experience in separation science, his group is focused on the development of analytical methods and instrumentation for bioanalyses.